We have been roasting coffee for a long time, yet the competition scene has really only evolved over the last 7 years. 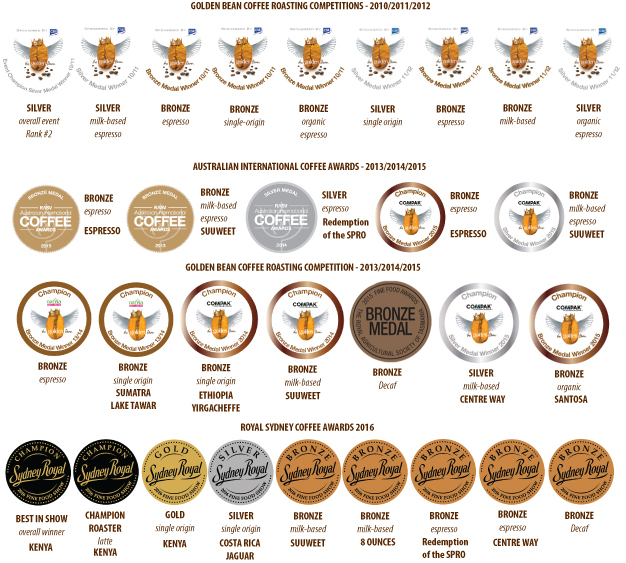 Whilst we may have been able to double that medal count by entering more categories (and more entries per category), we have just focused on espresso and milk-based espresso as these 2 categories are the most popular and important brew style for Australian coffee drinkers – it’s the bulk of the market for quality coffee. From the end of 2016, we are withdrawing our participating in commercial coffee competitions as there is now a fair level of unethical and systemic deception occurring within the industry. Unfortunately, the coffee industry is unregulated – which means you can buy X and sell it as Y and never get caught. This same level of mis-representation is taking place with medal winning coffees – leveraging the win across mass-marketed commodity products that bear little resemblance to the product that was submitted to the competition. We know of coffee companies investing tens of thousands in procuring special one-off coffee lots and doing special roasts on equipment they don’t use for their everyday coffees just so they can create a product worthy of entering into a competition. The question is…….does that reflect the everyday product the company produces ? Sometimes the awards and medals are not what they seem ! Generally, it’s the large and popular brand coffee companies entering competitions using their lab equipment as a competition platform – small 2kg, 5kg and 10kg roasting equipment. Yet they roast customer daily orders on large monolithic 60 – 240kg batch roasters that produce an entirely different, homogeneous result. In other words, it’s a different bean and a different flavor stamp – so it’s a different coffee entirely – what is the relationship or linkage back to the company’s profile ?. The reasons they do this are simple – their everyday coffees are in fact lower grade qualities deemed not worthy of the competition (or they consider it a risk to their reputation if they score poorly), so in order to enter the comp they have bought small, expensive lots just for the event – it’s not a representation of their product quality, just their cheque book. These small lots of coffee can’t be easily roasted on the large production equipment with the same control they have on the small roasters, or they can’t afford to waste coffees doing multiple batches until they produce the desired competition worthy result. In this regard, the concept of the competitions is somewhat flawed due to the potential for companies to exploit the rules by using coffees that are not part of their commercially available range and by roasting these one-off lots on equipment that is not used for their daily production. Bear in mind – the competitions are entered with coffees supplied by the company – not purchased via random retail. Recent examples of this are companies scoring Gold Medals in 2015 and 2016 from Geishas and rare micro lots, yet these coffees were not available to purchase as roasted products because they mysteriously “sold out” literally days after the event or it’s called “Obscure” – which is code for we bought the coffee exclusively to win medals. Customers can’t purchase these coffees as they only had enough for the competition event. The coffee was never going to be commercially viable at over $100 per kilo there are no cafes that can afford such a product and no customers willing to spend that sort of money – so it’s fair to say, what’s the point other than bragging rights……indeed. The question arises – how does that type of performance translate into validation for their brand and their product in an ongoing supply situation – was it true skill or just open cheque-book purchasing to boost their credentials and ego ? Our main production roasters are the Joper CRS30 and a Proaster 30kg. It’s these same platforms that roasted our wins and our every day coffees – no lab roasters, no special micro lots or obscure brands and descriptions. Why do some companies avoid coffee roasting competitions ? The coffee industry operates on a lot of hype and some brands attract and inflate this hype as a means of active brand promotion. Everyone is different and they are entitled to do whatever they like to promote their brand and competitions should not be the sole bellwether of a coffee company’s performance. We have been proud to receive awards for our substantially engineered blends and our precisely roasted Single Origin coffees. These are coffees we roast everyday and ship fresh to our customers around Australia from our Melbourne coffee roastery – more importantly, our winning entries are not special one-off, rare and exotic coffees that many other coffee companies tend to acquire purely for the purposes of entering into competitions to pickup medals for use in their marketing and then apply the “bait and switch” routine, offering an inferior coffee. If you are interested in reading more about coffee roasting competitions check out our blog here. Our award winning coffees are the “real deal” products you can buy from us fresh roasted any day of the week at the most competitive pricing. Putting aside the competition medals and awards, we believe the most important wins are when our customers provide positive feedback on our coffees – this is without doubt the most inspiring part of our passion for great coffee. Nothing pleases us more than when our coffees are compared to those from other companies that may have “higher profiles or over-inflated reputations” – more often we are rewarded with comments that our coffees are superior in almost every aspect.